Christophe de Margerie (6 August 1951 – 20 October 2014) was a French businessman. 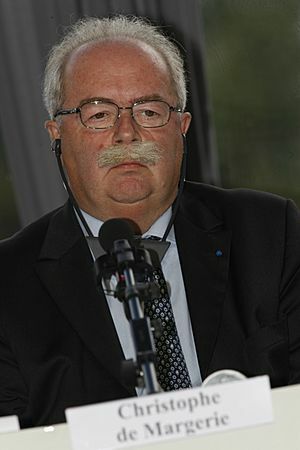 He was the CEO of oil company Total S.A.. de Margerie was born in Mareuil-sur-Lay, France. De Margerie died in an airplane crash in Moscow on 20 October, 2014, aged 63. Christophe de Margerie Facts for Kids. Kiddle Encyclopedia.